Sweet Potato Tamales with Pecans and Chipotle are a perfect sweet potato dish for your holiday or any day of the week. This spin on Authentic Mexican Tamales is sure to please the vegans in your life but, shhhh… no one else will know. Who says sweet potatoes must be smashed into a casserole dish and covered in toasted marshmallows? 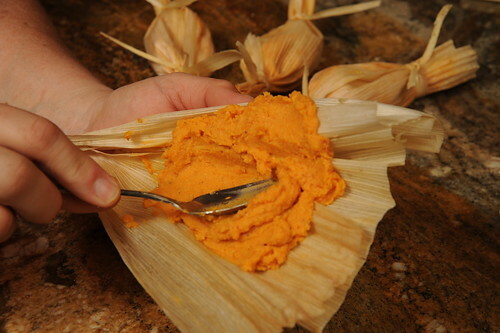 Try rolling the sweet potatoes into tamales with toasted nut filling and smokey chipotle seasoning. Tamales are quite a bit of work. But, these are much faster and easier. The nice thing about them is, you can gather friends and family around the table to help share the work and make lots of great culinary memories in the process. Even small kids can spread masa on a corn husk! 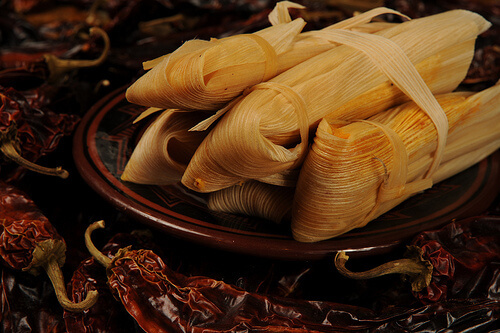 You never know – tamales could become one of your new family traditions. 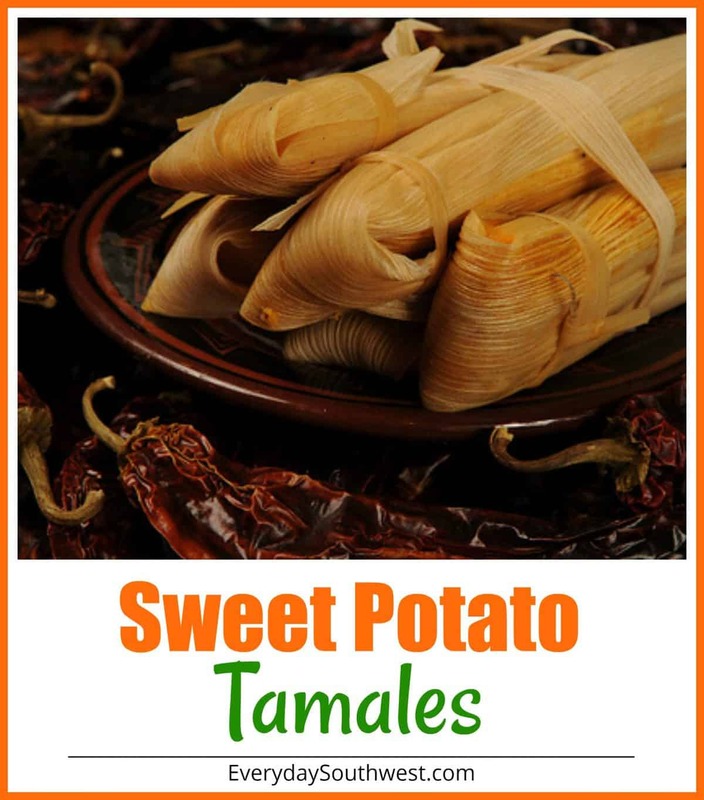 The chipotle and Southwest spices go so well with the sweet potato tamales that you might decide to use them in other sweet potato recipes. And don’t forget the pecans – or hazelnuts – in the center! Rinse corn husks in cold water and soak for at least 2 hours. Mix Sweet Potato “Masa” as directed. Spread masa on the corn husks evenly. Leave at least one to two inches of corn husk all around the masa to create a border. This border will allow the corn husk to seal in the masa when the corn husk is wrapped around the filling and steamed. 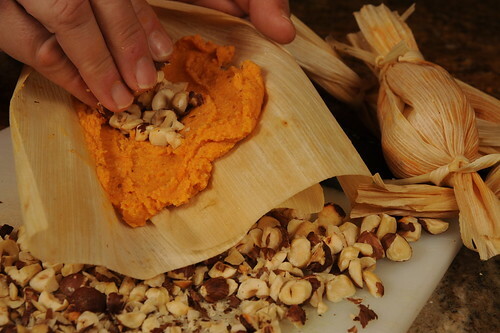 Add Nut filling to the center of the Sweet Potato Tamales. Bring the sides of the corn husks together and seal in the masa. Tie with a strip of corn husk, if desired. Place tamales upright in a steamer over steaming water. Cut sweet potatoes in half and place cut side up on a baking sheet. Spray with a little oil and bake for 50 to 60 minutes, until fork tender. Remove from oven and let cool. Remove skins and mash finely with a potato masher or food processor. You should have 2 cups mashed sweet potato flesh. Place in a mixing bowl. Bring to a boil the butter, sugar, broth and salt. With mixer on medium, mix in the broth mixture with the sweet potatoes until smooth. With mixer running, add in chile powder, cumin, masa, tapioca and baking powder a little at a time. Mix until fluffy, about 10 minutes on high speed. Let sit 10 minutes on counter to make sure masa is fully hydrated. Spread 1/3 cup of masa mixture in center of a corn husk, spreading in a square until a little thicker than 1/4 inch. Sprinkle about 1 tablespoon of nuts in center. Roll tamale in hands until masa mixture surrounds the nuts. Fold corn husks up at bottom. Steam tamales until firm, about one hour. I am not a sweet potatoes girl, but my husband wanted us to try this recipe. Amazingly, the spice from the tamales cancelled out some of the sickeningly sweet potato AND the sweet cooled the tamales off a bit. Perfect combination! The sweet potato filling in these tamales is genius! The textures and flavor work so well together. This was a hit in our house! 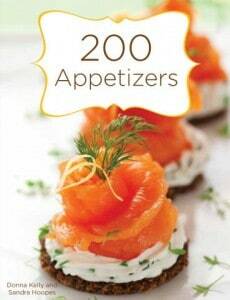 This was an incredible twist on the classic recipe! Loved it!